This messy bun crocheted beanie is the perfect accessory when exercising, running errands, or simply when doing chores! Craft a bunch in you favorite colors! In fact, this pattern is ideal for advanced beginner crocheters looking to add fun and easy crocheted items to their project list. The pattern contains detailed written instructions for one size. As always, you can tweak the directions and make the messy bun beanie any size you desire. Also included in the pattern are photos that will aid you in making this crocheted hat. This crochet pattern is another wonderful design by Ingrid Geerings. 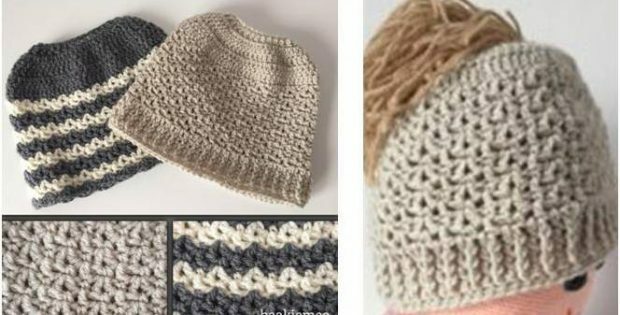 In fact, you can access the FREE pattern for this chic crocheted messy bun beanie from her website. Featured image: Haakjemee – thank you!